When your home is completely clean, you can walk inside from your long day and feel relaxed. Your home smells fresh, pure, and feels almost like an oasis. The best way to keep your home fresh and clean is by scheduling a KIWI Carpet Cleaning in University Park, Texas. KIWI Services has been cleaning carpets for 30 years and knows how to make your home shine again. KIWI’s services will make your home beautiful without being hard on your wallet, thanks to the KIWI Lover One–Year Carpet Cleaning Service. 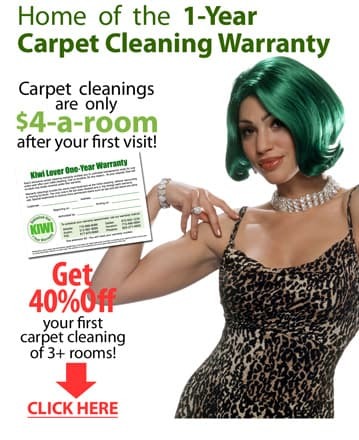 Customers who spend $120 or more on their initial carpet cleaning will automatically receive the warranty, which gives unlimited warranty cleanings for just $4 per room, plus a $37 trip charge. KIWI not only has a commitment to keeping your wallet full, but also to provide safe and environmentally friendly services to you and your family. That’s why we only use all–natural ingredients in our carpet cleaning solution, which is 100% safe for kids and pets. We also only employ the use of the dry carpet cleaning method, which produces no wastewater and dries in about 15–45 minutes. To schedule a carpet cleaning in University Park, call one of our service representatives in the Dallas area KIWI Services Center!